Because of Unresolved Issues such as Carried Interest and Revenue Neutrality, Will GOP Tax Reform Effort Become a Cluster-You-Know-What like Obamacare Repeal? While I realize there’s zero hope of ripping up America’s awful tax code and getting a simple and fair flat tax, I’m nonetheless hopeful that there will be some meaningful incremental changes as part of the current effort to achieve some sort of tax reform. A package that lowers the corporate rate, replaces depreciation with expensing, and ends the death tax would be very good for growth, and those good reforms could be at least partially financed by eliminating the state and local tax deduction and curtailing business interest deductions so that debt and equity are on a level playing field. All that sounds good, and a package like this should be feasible since Republicans control both Congress and the White House (especially now that the BAT is off the table), but I warn in this interview that there are lots of big obstacles that could cause tax reform to become a disaster akin to the Obamacare repeal effort. Here’s my list of conflicts that need to be solved in order to get some sort of plan through Congress and on to the President’s desk. Carried interest – Trump wants to impose a higher capital gains tax on a specific type of investment, but this irks many congressional GOPers who have long understood that any capital gains tax is a form of double taxation and should be abolished. The issue apparently has some symbolic importance to the President and it could become a major stumbling block if he digs in his heels. Tax cut or revenue neutrality – Budget rules basically require that tax cuts expire after 10 years. To avoid this outcome (which would undermine the pro-growth impact of any reforms), many lawmakers want a revenue-neutral package that could be permanent. But that means coming up with tax increases to offset tax cuts. That’s okay if undesirable tax preferences are being eliminated to produce more revenue, but defenders of those loopholes will then lobby against the plan. Big business vs small business – Everyone agrees that America’s high corporate tax rate is bad news for competitiveness and should be reduced. The vast majority of small businesses, however, pay taxes through “Schedule C” of the individual income tax, so they want lower personal rates to match lower corporate rates. That’s a good idea, of course, but would have major revenue implications and complicate the effort to achieve revenue neutrality. 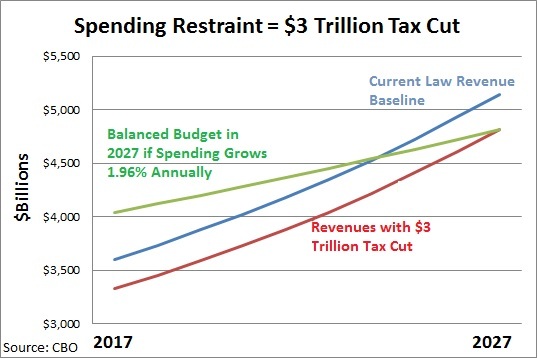 Budget balance – Republicans have long claimed that a major goal is balancing the budget within 10 years. That’s certainly achievable with a modest amount of spending restraint. And it’s even relatively simple to have a big tax cut and still achieve balance in 10 years with a bit of extra spending discipline. That’s the good news. The bad news is that there’s very little appetite for spending restraint in the White House or Capitol Hill, and this may hinder passage of a tax plan. Middle class tax relief – The main focus of the tax plan is boosting growth and competitiveness by reducing the burden on businesses and investment. That’s laudable, but critics will say “the rich” will get most of the tax relief. And even though the rich already pay most of the taxes and even though the rest of us will benefit from faster growth, Republicans are sensitive to that line of attack. So they will want to include some sort of provision designed for the middle class, but that will have major revenue implications and complicate the effort to achieve revenue neutrality. There’s another complicating factor. At the risk of understatement, President Trump generates controversy. And this means he doesn’t have much power to use the bully pulpit. Though I point out in this interview that this doesn’t necessarily cripple tax reform since the President’s most important role is to simply sign the legislation. Before the 2016 election, I was somewhat optimistic about tax reform. A few months ago, I was very pessimistic. I now think something will happen, if for no other reason than Republicans desperately want to achieve something after botching Obamacare repeal. Video can be found on YouTube, searching “Fixing the Federal Government”. Posted this previously, but it was “unavailable”. Your CBO chart and claiming the budget can be balanced in 10 yrs with some spending restraint is poppycock… CBO lies about yearly deficits. They claim in FY 2016 the budget deficit was $587 billion, yet when you visit the treasury site national debt to the penny you find we borrowed $1.4 trillion. A discrepancy of a mere 900 Billion bucks. The GOP will not reform taxes in truly significant ways because, like the Democrats, the Republicans are primarily creatures of DC, dedicated to the continued growth, power and influence of The Swamp. President Trump was elected, more than anything else, to “Drain the Swamp”. The Swamp Creatures are resisting him in every way they can. Our Declaration of Independence: “… That whenever any Form of Government becomes destructive of these ends, it is the Right of the People to alter or to abolish it …”. Our federal government has become inimical to the ends for which it was established. DC needs to be shown that the power resides with the People and the States, not with the DC Swamp.